“The Power of a Single Conversation: Field Experiments to Accelerate the Impact of Social Science"
Single conversations between people with diverse forms of expertise can greatly reorient thinking and spark creativity. Adam Levine applies this insight to expanding the public impact and relevance of social science. Most large-scale efforts to connect research and practice have focused on longer-term relationship-building, such as via knowledge brokers, research-practice partnerships, university extension programs, and research collaborations. These avenues of engagement are incredibly important, yet they aren’t always what practitioners need or have the capacity for. Sometimes all they need or want is a single conversation about a problem they’re facing in their work. 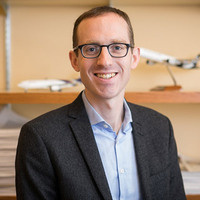 Adam Seth Levine, associate professor in the Department of Government,Cornell University, studies civic and political engagement. He received his Ph.D. from University of Michigan and is the author of American Insecurity: Why Our Economic Fears Lead to Political Inaction. He is also the president of research4impact, a nonprofit organization that facilitates and promotes collaboration between scholars and practitioners. Students & Faculty: Small room; must register! Note: This talk is for STUDENTS, FACULTY, STAFF due to limited number of seats.